Following the Japanese tour we’ve all had a couple of weeks off to recover. If you haven’t been following us on twitter there’s a whole bunch of Vlogs from the tour on YouTube here. But now, we’re starting to gear up to release the new record in the UK & Europe. We’re shooting a new video over the next few weeks for a forthcoming single, and we have a one-off show on the 11th of November in Maidstone (you can download a flyer here). 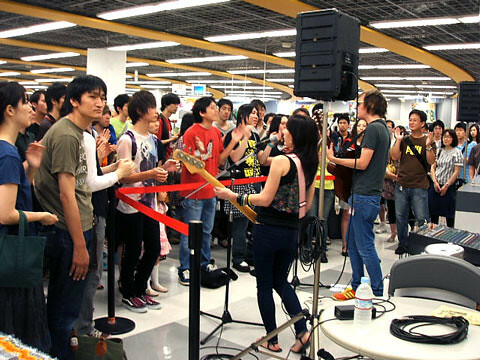 The FARRAH Japan Tour 2009 starts tonight at Thumbs Up! We are delighted to announce that Farrah will be joined on stage for 1 song by our friend Gotchi from Asian Kung Fu Generation! See you tonight! Well, Greetings to you all. Due to Jez and Michelle’s sterling vlogging efforts from Japan – at which I was also present, but hampered by acute humidity and low personal agility – you have all been spared my attempts at blogging. Still, it couldn’t last. Some months ago, our good friends at Lizard Promotions ( Hola, Juancho! ) in Spain offered us a festival appearance in Pontevedra. This city is in Galicia, an ancient and somewhat rainy province with a climate akin to Cornwall or Ireland. Having checked the quality of the local seafood ( Vigo being one of the main fishing ports in the World ) I accepted with alacrity. We were to support legendary post punk behemoths – or at the very least, moths – The Only Ones, of “Another Girl, Another Planet” fame. And so it was that Dana, Jez, Andrew and I arrived at Heathrow’s Terminal 3 last Friday for a tortuous journey to Vigo. As our more well-travelled readers will appreciate, a 9.30 am flight does involve at 7.30 am check in. Which in turn, involves a 5.30 am “waking up”. Which, in further turn, involves grumpiness, and swearing ( on my part ) , and a distinct lack of espresso. Still, we checked in and were subjected to the usual comedy routine involving the weight / size etc of our guitars and keyboard. Like most bands, when we do a one-off show outside the UK, the promoter supplies the amps and the drum kit and we turn up with guitars, effects pedals, and the keyboard. After some delays – which were entirely at the hands of Spain’s National Embarrassment ( “SNE” ) – sorry, “airline” – Iberia, we arrived in Vigo. However, our keyboard did not arrive and SNE were unable to tell us exactly where it was…but they “hoped” it might arrive in time for the show tomorrow. We made it to the hotel in time for the amazing dinner laid on by Juancho in the rather swanky hotel restaurant. I enjoyed a rather nice tuna salad followed by a veal steak that would have felled normal mortals, and nearly consigned Dana to the local weighbridge. The entire dinner – large supplies of the local Rioja, fine breads, the presence of one of the other bands – Vibeke Saugestad ( “VS” ) from Norway – was utterly marvellous ; yet only marred by a waiter who I can only assume was the spawn of Joe Pesci and Basil Fawlty. Possessed of an utter inability to either (a) count or (b) understand the concept of vegetarianism, the diminutive Pesci Junior wreaked havoc upon the table for most of the evening. We then strolled up to the gig – a free show, the Vibrasons Festival, in the main city square in Pontevedra – and were pleasantly surprised to see a huge stage, moving lights, video backdrop and a great PA…pausing awhile backstage to “check” the cans of Heineken were at the correct temperature for tomorrow’s show, we enjoyed most of VS’s set before calling it a night. The next day dawned and, after I had sampled some local sardines in the company of Jez, who manfully tackled a large cheese platter and some “pimientos de padron” – we rapidly realised that due to the utterly useless SNE, the arrival of our keyboard and perhaps more importantly our bass player were by no means guaranteed. A series of texts from Michelle indicated that she was at the mercy of a series of late departures, incorrect boarding passes, cancellations, plane changes and sundry other shenanigans at the hands of the appalling SNE. The band soundchecked without Michelle, with Jez standing in on bass – rather like Rush, but with less screeching. Eventually, Michelle and the keyboard arrived in time for a quick dinner ( the keyboard just had a starter ) and we then hoofed it down to the gig to discover that everything had moved back at least 45 minutes. Thank God for the tenuous grasp of timings exhibited at most Spanish shows. The set went down a storm in front of an alcohol-fuelled crowd who had just been cheering on their matador heroes at the local bullring, and who had arrived armed with large water pistols which thankfully were not aimed at any high-voltage equipment. Suddenly, I heard Jez announce that it was the last song and legged it to the side of the stage to discover that the production manager had somewhat over-zealously read the stage time sheets incorrectly and thought we were doing 45 minutes instead of an hour. It’s certainly not what I was hoping for when I was trying to arrange being “pulled off in Pontevedra”, but the band wisely decided to end on a high with “No Reason Why” and exited the stage, mildly baffled and indeed disgruntled. I then decided to attempt to sell some Spanish CD copies of “Me Too” that were lying around, and I report to you verbatim the following exchange with a “young person” ( “YP” ). YP : ( swigging from large 5 Euro bottle of beer ) “Give it to me free”. So there we have it, ladies and gentlemen. The problems of the record industry ( not the “music industry”, mind you, just the record industry ) summed up in one semi-inebriated exchange in a town square in Spain at 12.30 am. To this young person, I say listening to the radio or Spotify is like window shopping. We all enjoy a bit of that, in fact some of us are happy to do it all day long. But then go into the shop and ask for the clothes, shoes, magazine, or chewing gum for free…and see what happens. I won’t bore you with the antics of SNE the following day other than to say…late plane…another late plane…stress about missing connection…7 Euros for a sandwich, 2.50 Euros for a small tub of Pringles…quite beyond belief bad. I would rather smear myself from head to foot in jam and jump into a wasp’s nest than ever fly on Iberia again. Thank you Juancho, Nore, Richie and Pontevedra for an amazing time…we will be back in Spain very soon! Hello everyone, I hope the sun is shining where you are (unless it’s night time, that would be a bit worrying). We had a vocal rehearsal last night round at my huge mansion in Mayfair. I gave the servants the night off while we ooohed, aaaahed and whoooaaahhhed our way through songs old and new. We’re playing two songs we’ve never played live before at the Vibrasons show this weekend; Just Driving’ and ‘Heavy Metal’. Both songs involve some Def Leppardesque ‘whoooahing’ which is quite hard to do with a straight face. Vocal rehearsals are always chilled affairs. Some beer was drunk, some curry was eaten, some breeze was shot, all in all a great night. Tonight we’re rehearsing electric. We’ll be running the set, hopefully not ruining the set! Hope some Spanish fans are reading this and can come to the festival. Hola to you all! Hey all of you. Just got back from Japan and got over the jetlag (and seeing ‘The Boat That Sucked, sorry, Rocked’ on the plane). Me and Michelle had an amazing time in Japan on our brief trip to promote the band’s new record. The album seems to be flying off the shelves in Tower Records and HMV and I’d just like to say thanks to some great people who made the whole trip so successful. So, (in no particular order) thanks; Masa, AKFG, Ken, Katsu, Takeshi, the staff at Tower Records, Nozomi, Graham, Koko the hairstyler, DJ Aiko, JJ and Space Shower TV, saucy DJ Sheila, Terry, Tomo, Sekki and all the other great people at Fabtone, Kazumi for inviting us to DJ, and a special thanks to all of those fans who came and said hello to us at the various shows we did. It was great meeting you all. If i’ve forgotten anyone- big apologies. So what was the highlight? Too many to mention really. Obviously, playing the Nano-Mugen festival was great but we also had a brilliant time just sampling food on sticks in Shibuya, DJing at Hobgoblin, wandering on Zushi beach and hanging out with members of Asian Kung-Fu Generation, Hard-Fi, Ben Folds and Nada Surf. So we’re now looking forward to playing the Vibrasons festival next week. We’re on just before ‘The Only Ones’ who I’m really looking forward to seeing. We’ve got some rehearsing to do at the weekend and next week. Can’t wait to see the Spanish fans! 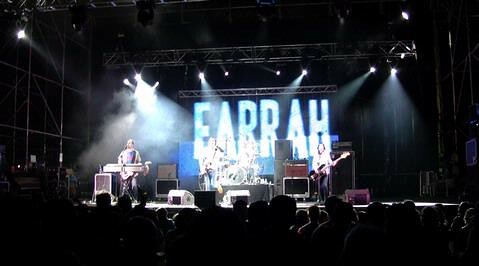 We tried our best (as half of Farrah) to play a good show and the audience were really good to us. It wasn’t the same without Andrew and Dana though. We head back to the U.K tomorrow. We return to Japan in September as a full band. I can’t wait! 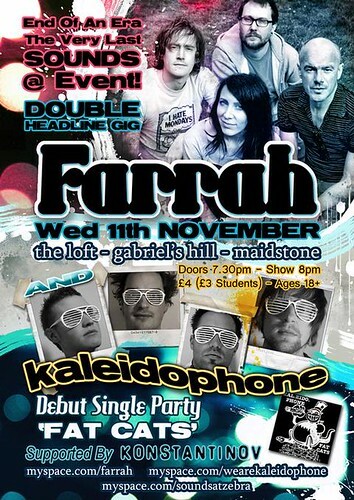 Half of Farrah acoustic is all very well but Farrah electric is going to blow the roof off! Welcome to the first Farrah blog of 2013!